Start taking orders from your customers using messenger platform. Our chatbot is specially programmed for restaurants and food outlets, it will interact with your clients on your behalf. Your clients do not need to download any app or software to place orders, they can use messengers already installed on their devices. If your clients do not have any messenger, even then they can place orders directly from the web. You client gets notified about the status of their order, and you don't have to call them for any update. You clients scans the QR code, once they scan it, they will be redirected to the the messenger screen. Alternatively they can open your facebook page messenger manually. 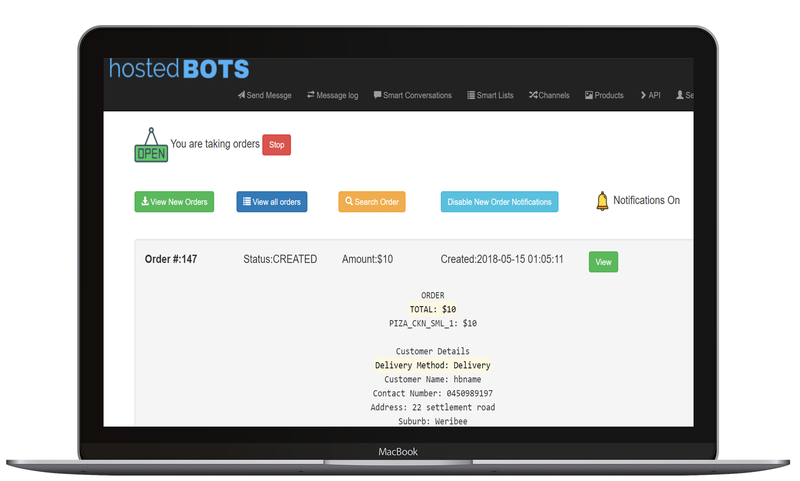 Our automated chatbot interacts with your client and take orders on your behalf. Your clients gets the impression as if they are chatting with you. Once your client places the order, you get notified. You can manage the orders through our state of the art order management dashboard. While you are working on the order, your client is kept posted by regular updates about the status of their order. Stop taking orders if your business is closed! Advertise Special of the day on foodbot! Do you want to run a special deal for one day or have some food in excess that you want to give at half price. Foodbot can let you set special of the day with special price so you are not limited to a static menu. Unlike other order management systems, we give you the flexibility of starting or stopping orders. You can simply stop taking order when your outlet is closed and resume it when you open it again. We understand that you don't just want to offer same menu items every day, you can now manage special of the day or meal of the day and can also set the price for it. You can flag users that you do not want to take orders from and they will not be able to place any order through their account. See report with all your historical orders and their status and measure the performance of your store. Or you can scan this code on your device and type "EAT"